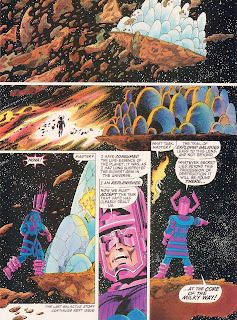 The Last Galactus Story is a mystery that has Galactus and his herald Nova speeding to the center of the universe to investigate the destruction of several galaxies. There they encounter Ecce, one of the near-omnipotent race of Watchers. Ecce was the Watcher who had witnessed Galactus’ birth. This story featured some of the more impressive Byrne art of the 1980s. The inks by Terry Austin add just the right amount of style and finish to Byrne’s pencils. Equally, the coloring was rather impressive as well, giving a water-colored feel to the pages. Galactus battles the Watcher who showed up at the end of the last published chapter. This turns out to be the same Watcher who witnessed the "birth" of Galactus - yes, that was not Uatu - and who has been driven insane by his guilt over all the deaths that have happened because, as he sees it, he did not snuff out the nacent Galactus when he had the chance. As the two battle, over millennia, the universe basically dies around them. The stars burn out. No "Big Crunch" of everything collapsing back onto itself to be born again. Entropy wins over all. 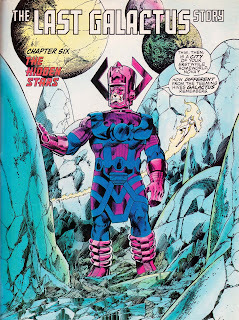 As the universe verges on flickering out of existence, Galactus draws into himself the last shreds of energy, giving him just enough of an edge to defeat the rogue Watcher. But then Galactus and Nova are alone in an empty, endless void. The universe as we know it is gone. Galactus finally understands what it's all about. What he's been doing all these billions of years. He cracks the seals on his armor, and all the energy he has absorbed spews out of him. He becomes, effectively, the Big Band of the next universe. Nova survives - and herself becomes the "Galactus" of that universe, the cycle beginning once again. Byrne had even attempted to work with Marvel to blend the story into the “Last” Fantastic Four story. Unfortunately, X-Men – Hidden Years was cancelled and pretty much ended Byrne’s relationship with Marvel. They should compile and get Byrne to complete the story.. I totally agree. Been waiting for this story and art forever! Here's a paste-up I did for the final chapter, based on Byrne's description. Another round of 1980s Marvel Trivia!